1. Sole proprietors, LLCs, S corps, partnerships and other pass-through entities qualify. 2. Real estate and rental business income — including self-rentals — may qualify. 3. Some businesses are specified as ineligible and you may need a professional to determine if you qualify. 4. Service-business owners could get a deduction on 20% of their income, subject to income limitations. 5. A business owner with $315,000 in taxable income owes tax on only $252,000 — saving more than $12,000 of income tax. 6. If you are married filing jointly and have more than $315,000 of income, the 20% deduction is subject to a phase-out. The phase-out begins at $157,500 for single filers. 7. If you have more than $415,000 of income from the service business, the 20% deduction is eliminated ($207,500 for single filers). 8. To keep your income below these thresholds, consider contributions to a defined benefit (DB) plan. 9. DB plans require you to commit to funding a defined benefit plan instead of a defined contribution plan, making them more complex. 10. 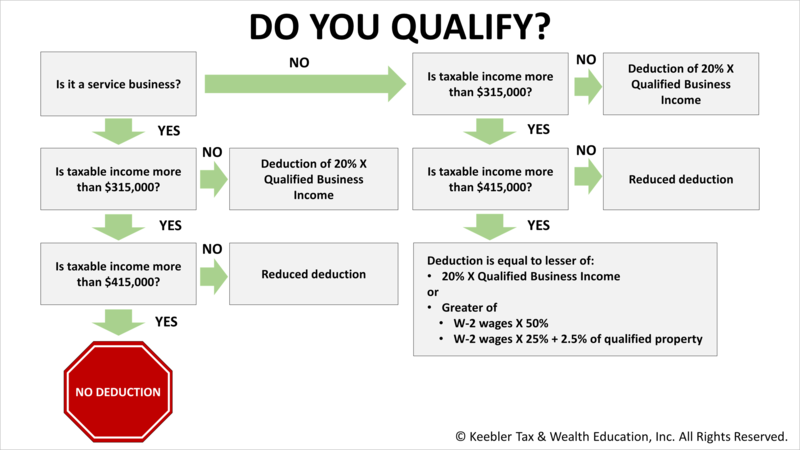 A DB plan can supercharge retirement savings while minimizing your taxable income to enable you to qualify for the 20% deduction for business owners.